See also Texas on Wikipedia, Texas in the 11th edition, and the disclaimer. TEXAS, the largest in area and the eleventh in population Boundaries. of the United States of America, is bounded by the Gulf of Mexico on the S.E., by Louisiana and Arkansas on the E., by Arkansas and the Indian Territory on the N., the latter extending north of its northern prolongation (the Panhandle), by New Mexico on the W. and N. of its western prolongation (the trans-Pecos region), and by Mexico on the S.W. Its area in 1880 was 262,290 square miles, or one-eleventh (nearly 9 per cent.) of the entire area of the United States. The extreme length is 740 miles, the breadth 825, and the coast line 400 miles. The boundaries, as recognized by the United States Government, are—the Gulf of Mexico from the Rio Grande to the Sabine river, the Sabine river to 32° N. lat., thence the meridian of 94° 10' to the Red river of Louisiana, thence following that river west to its intersection with the 100th meridian, thence north to lat. 36° 30', thence west to 103° W. long., thence south to lat. 32°, thence west to its intersection with the Rio Grande, which river constitutes the south-western border of the State to the Gulf of Mexico. commonly known as the “Staked Plain” (Llano Estacado). It is the direct southern continuation and termination of the great plains of the North American continent which extend along the eastern slope of the Rocky Mountains from British America to the Rio Pecos. The eastern edge is well marked by a steep escarpment, which, in consequence of destructive erosion, is constantly receding to the westward. The surface is smooth, and utterly devoid of forest growth or streams of water. But there are many small ponds or lakes, and in the southern part these are saline. The soil is light, rich, and porous, and is covered with a good growth of grass. Until a few years ago this region was totally unpeopled, but many portions of it are now (1887) used for grazing purposes, water being secured by means of wells or artificially constructed reservoirs. The altitude ranges from 2500 to 4000 feet. (5) The trans-Pecos or mountainous region west of the Pecos river is composed of numerous mountain peaks and ranges, with intervening valleys of many miles in width. It is poorly watered, and the population outside the immediate Rio Grande valley is very sparse. The general level of the country is from 3000 to 5000 feet. The rivers are separable into several sub-systems. The Rio Grande and the Arkansas, constituting the north and south limits of the Texas drainage system, with their respective tributaries, the Pecos and the Canadian, originate in a limited district of northern Nuw Mexico and Colorado, and ultimately reach the sea at points a thousand miles apart. The Canadian and the Pecos have cut deep cañons through the Llano Estacado. The former continues eastward through Indian Territory, and the latter southward, joining the Rio Grande between 101° and 102° W. long, on the southern border of the State. The Rio Grande and the Pecos receive no tributaries of importance in Texas, but are constant in their flow. The next and most important group comprises the Red, the Brazos, and the Colorado, all of which originate along the eastern border of the Llano. They traverse similar regions, and have a general resemblance in character of sediment, irregularity of flow, velocity, and topography of drainage basins. Their brackish water is principally derived from the sudden precipitation of rainfall along the gypsiferous escarpments of the Llano. Its volume is ordinarily small, the flow often ceasing entirely west of the black prairie region. There are periodic freshets, however, which suddenly swell the volume to enormous proportions. These freshets, laden with the rich red loam of the plains, usually reach the lower in habited sections of the State in periods of drought, and are termed “red rises.” Much of this sediment is deposited upon the flood plane of the lower valleys, and by this process the most valuable sugar and cotton lands of the coast plain have been built up. Another important group consists of the Sabine, the Trinity, the San Marcos, the Gnadalupe, and the Nueces, most of which have their origin near the western border of the black prairie region. These streams have a greater volume and are more constant in flow than any others, and are usually without deep cañons or wide bottoms. Many of them, especially those south of Austin, have their origin from large springs situated along the foot of the escarpment line extending from Austin southwestward. Another subsidiary system of streams originates in the narrow Quaternary region along the coast, within the district of the greatest rainfall. These streams are tidal, and sometimes navigable towards their mouths. Most of them are locally known as bayous. In general, the rivers of Texas are not adapted for irrigation or navigation. Neither do they afford much available water power north of Austin. The entire geologic series, with a few exceptions, is represented in Texas. The earlier Palæozoic rocks, including the pre-Cambrian (Keweenawian; A in accompanying geological map), the Potsdam (OC), and the Ordovician (OC), up to the Trenton, underlie the State, but are only exposed in two limited districts. The first of these is in the counties of Mason, Llano, Burnet, and San Saba in the central region; the other is in the disturbed mountainous portion of the trans-Pecos region. The Cambrian was deposited horizontally upon the upturned Keweenawian, and the Ordovician appears to rest conformably upon the Cambrian (Potsdam); but there was a continental elevation of the whole region, probably commencing at the close of the Trenton epoch, which continued until the beginning of the Coal-measure epoch, for the Upper Silurian, Devonian, and sub-Carboniferous are absent, and the earlier rocks are disturbed. These earlier Palæozoic sediments present no marked stratigraphical or palæontological differences from the same formations throughout the continent, and thus show the widely distributed uniformity of conditions which then existed. At the commencement of the Carboniferous period, however, that marked difference of faunal, lithological, and stratigraphical features began which distinguishes the synchronous deposits of the later formations of the western and eastern portions of the United States. The Texas region has been the transition ground, and hence all the geologic deposits, beginning with the Carboniferous, have two faces, dependent upon their geographical position east or west of 100° W. long., and representing the sediments either of interior continental basins or of the waters of the Atlantic during alternating periods of submergence and emergence. pre-Cambrian, in the central and trans-Pecos Palæozoic deposits. towards the Gulf of Mexico after passing south of 33° N. 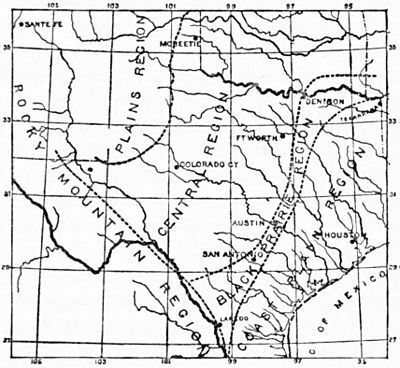 lat., and take a south-easterly course through Texas into Mexico, the trend of their axes being generally parallel to the direction of the Rio Grande and its principal tributaries. The only true mountains in Texas are situated west of the Pecos, with the exception of a few foot-hills (lomitas) which re-enter the State from Mexico near Eagle Pass and follow the river to an undetermined point below Laredo. The principal ranges are the Guadalupe, Limpia, Chinali, Los Chisos, Organ, and Franklin Mountains. They are composed of older rocks, in most places; the later formations have been washed away, except where protected by eruptive flows. The most eastern and northern of these mountains are usually the highest. Guadalupe Peak is 9000 feet; Limpia Peak and the crest of the Chinalis, from 3500 to 8000 feet; Eagle Mountains, 7000; and the intervening valleys from 3500 to 5000 feet. The low buttes of the central region are miscalled mountains upon most maps. There are several well-defined escarpments extending for long distances, approximately north and south The step of the first of these, from Austin to Eagle Pass, is from 200 to 500 feet high, and is the result of an elevation at the close of the early Cretaceous period. Near the 100th meridian another escarpment occurs, and along the eastern and southern borders of the Staked Plain still another. The western part of the coast plain has a few low hills. The rest of the State has no notable prominences. with the exception of the Llano county granite. Temp. Mean Precipitation in Inches. Spring. Summer. Autumn. Winter. Annual. Galveston and Austin. In the Panhandle the winters are severe. cedar, juniper, and mesquite are only utilized for fuel and fencing. faunas of all temperate North America, east of the Pacific slope. 1850 .. .. .. .. .. .. 212,592 ..
and along the Rio Grande, where it is Mexican. the lower Rio Grande valley. increased from 1048 in 1872 to 5974 in 1882, and to 7034 in 1886.
technical training is made secondary. homestead and exemption laws are unusually liberal to the debtor. a state of the republic. It was shortly after this that the first American colonists were permitted to enter the territory under Government patronage. Within ten years over 20,000 had settled between the Sabine and the Colorado. In 1830 the Mexican Government placed them under military rule, from which, with accompanying impositions, originated the war of Texan Independence. The Anglo-Americans were assisted by volunteers from the United States, and the war was terminated by the defeat of the Mexicans under General Santa Anna at San Jacinto, 21st April 1836. From 1837 to 1845 Texas was an independent republic. It was admitted to the United States on 29th December 1845, in spite of the protests of Mexico, and a war with that country immediately ensued. The new State sold to the United States Government for $10,000,000 all the territory west and north of the present boundaries between the headwaters of the Rio Grande and the Arkansas. But it reserved the control and disposal of the public lands within its borders, which have proved a magnificent source of revenue, and also the right to divide into five states, should future growth and development justify it. By a small majority the State seceded from the Union in 1861. In 1868 a new constitution was adopted, and the State readmitted into the Union. In 1874 the Kiowa and Comanche Indians, who had prevented the settlement of the central and plains regions from the earliest times, were subjugated. ↑ The State does not recognize the South Fork of the Red river as the northern boundary, but insists upon the North Fork; it also claims the 100th meridian as laid down upon Mellish's map (100 miles east of the true meridian) as the eastern border of the Panhandle. VOL. XXIII. TEXAS PLATE III.